Starting next Wednesday, July 16, all eyes in the fishing world will turn towards the land of Mickey Mouse and his Magic Kingdom deep in the heart of central Florida. Because just down the road from Disney World is when and where the biggest gathering of the year will be taking place for the recreational fishing industry. Known as the International Convention of Allied Sportfishing Trades, or ICAST for short, the 2014 event is the annual trade show put on by the American Sportfishing Association (ASA). In short, ICAST is without question the world's largest gathering of manufacturers, sellers, buyers, professional anglers, fishing celebrities and even a swarm of camera- and laptop-toting outdoors media. At the same, in the same Orange County Convention Center building, the International Fly Tackle Dealers 2014 show will be taking place in Orlando. 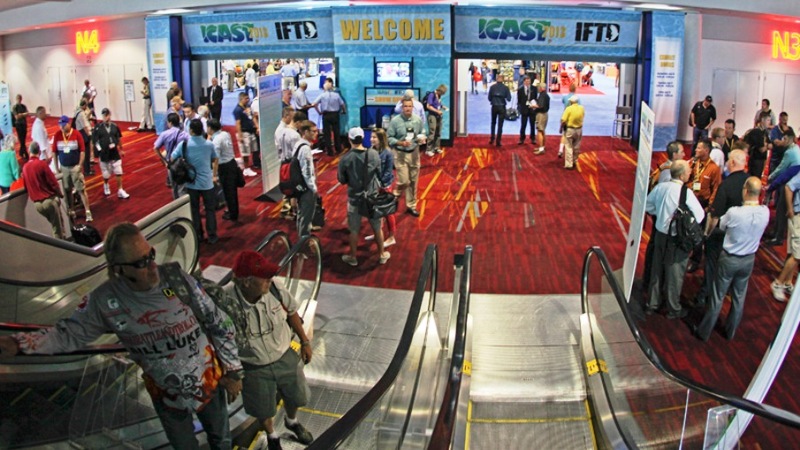 Like ICAST, the 2014 version of the IFTD is a show that is the largest annual gathering of fly fishing manufacturers, retailers, sales people and buyers, conservation organizations, and industry pros and celebrities throughout the fly fishing world. The ICAST and IFTD shows are so big and so important that just about anybody who is anybody in the worlds of freshwater fishing, saltwater fishing and fly fishing will be there. The editorial team of OutdoorChannel.com will be there too, giving readers a close-up look at the show despite the fact that it is officially open only to industry members, professionals and media. We'll kick off our ICAST 2014 show coverage the day before the show actually opens on Tuesday, July 15, with a story or two, and maybe a tale about the fishing that the Sunshine State of Florida has to offer. The next day, we'll pick up speed and continue non-stop through the show's duration, July 16-18. Along the way, OutdoorChannel.com readers will find real-time product alerts throughout the day; gear round-ups on the latest in lures, rods, reels, fishing lines, electronics, clothing, sunglasses, angling accessories; and fly fishing gear. There also will be daily wrap-up stories along with a selection of photo galleries and notes-and-quotes that help to tell the cyber-print tale of ICAST 2014. During the show's run, OutdoorChannel.com will be paying close attention to a number of things happening on the show floor each day and the stories that emerge from those spots. ICAST Lure Tank: This is a place where the latest in hard and soft lures will be put into motion by the pros in attendance. With a big television monitor showing the bait off, attendees will get a bird's eye view of how lures perform on top of the water, in the middle of the water column, and on the bottom. ICAST Apparel Display: An area to show off the latest in high-tech fashion, storm-proof rain gear and sun-protection clothing developed and manufactured by a number of show exhibitors. ICAST New Product Showcase: This is a gathering of the latest products that represent the next generation of lures, rods, reels, fishing line, boats, motors, electronics, clothing, sunglasses, fly fishing gear and a whole lot more. Not only will we profile many of these new products, we'll also let readers know how the annual "Best of Show" voting turns out in 21 different product categories and which new item wins the overall top-dog award for 2014. As part of the show coverage, OutdoorChannel.com will be telling the tale of ICAST 2014 from the show floor by way of live streaming video. Mark Davis, Dave Mercer and crew will offer their take on what is happening down in Orlando. * 10:00 am: ICAST 2014 best new products review; some closing statements; and a recap of everything our crew heard, saw and experienced this year. In addition to our coverage of new products, the story lines that develop in the convention center, and our live-video streaming detailed above, OutdoorChannel.com also will be there for the show's other important gatherings and parties. Those include the ASA's annual "State of the Industry" breakfast as the ASA's CEO and president Mike Nussman teams up with ASA Board of Directors chairman Gregg Wollner of Rapala to give their take on the industry. We will stick around and hear from the breakfast's keynote speaker Lee Corso, an avid angler, a central Florida resident, a former college football coach and the well-known co-host of ESPN's College GameDay. And who knows; with a little luck, maybe we can even convince Coach Corso to give us his thoughts on the upcoming college pigskin season, a few fishing tips, and maybe even get him to put on the mascot costume of his favorite fish species? Along journey through the maze that will be ICAST 2014, OutdoorChannel.com will stop long enough to listen to the stories of some of the sport's leading figures. And when those stories need to be passed on to you, don't be surprised to see a feature story or two emerge from the trade show's floor. Does all of this sound like a can't-miss endeavor if you love the sport of fishing like we do? We'd like to think so, which is why we would like to personally invite you to visit OutdoorChannel.com early, often, and late July 16 - 18. If you'll do so, we promise to give you the very latest in product updates, the latest in breaking ICAST 2014 show news, and the best editorial coverage on the planet for fishing's annual trade show gathering. It promises to be a fun filled week as we live, breathe, sleep and celebrate the sport of fishing next week right in the big shadow of Mickey and his Magic Kingdom.